Samsung has dominated the Android phone market for at least a half-decade, but the Galaxy Note 7 debacle last year lost the company goodwill with customers after its phones exploded in pants, hotel rooms, airplanes, and elsewhere. Now, in the wake of a global recall that will reportedly cost the company some $5 billion in profits, Samsung needs a new smartphone hit. To get there, the South Korean giant is depending on its reliably popular “Galaxy S” smartphone series. Recently, new iterations of the Galaxy S phones have announced at MWC in Barcelona, but this year Samsung’s held off on announcing its new Galaxy S phone at the conference. Instead Samsung sent out invitations for a special media event on March 29 in New York City, and based on the invitations, it’s safe to presume Samsung will use the event to launch its newest Galaxy smartphone—especially as the invitation includes the words “Unbox Your Phone” with the silhouette of what looks like a smartphone. For now, we can only speculate about what exactly this means, but luckily for us, there are plenty of clues posted around the web. With that in mind, here are some of the most credible rumors, leaks, photos, and videos that give us greater insight into what we can expect from Samsung’s upcoming media event. If there’s anything we’re practically certain of, it’s that Samsung’s two newest phones will be called the Galaxy S8 and Galaxy S8 Plus (distinguished by their screen size). Samsung has remained faithful to the “Galaxy S” naming convention for the last seven years, and it appears that the company is going to stick with it despite last year’s mishap surrounding the Galaxy Note 7. The Galaxy Note series, of course, is not the same as the Galaxy S series, but there were concerns from experts about whether the company had tarnished the entire Galaxy brand. The phones often borrow features from each other and even use the same hardware. Despite the drama, Samsung appears to be betting that people will be willing to forget about its exploding batteries problem. Add these rumors to the subtle clues like Samsung calling its launch event a “Galaxy Unpacked” event as it has during past flagship phone announcements, and it appears that this mystery is all-but-solved. Will it feature a crazy new design? In the teaser trailers that Samsung premiered at Mobile World Congress this past weekend, the company paid lots of attention to popular smartphone designs. 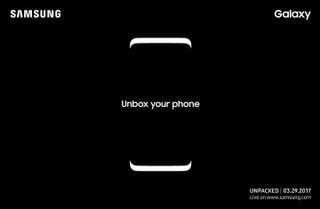 Both of the new Galaxy S8 teaser trailers suggest that Samsung believes it will soon reinvent the smartphone. You’ll notice that Samsung is almost entirely focused on the evolution of the smartphone, insinuating that its newest phones will be the next big evolutionary step. Yet leaked images appear to show an iterative, familiar design. There are already a bunch of photos and videos purportedly featuring leaks of the Galaxy S8 in all of its glory. The leaks come from a number of different internet accounts and mostly share the same design elements, making them more credible as a collective whole. The photos and videos show that Samsung is basically remaining faithful to many of its older, more popular concepts. One of the most prolific Galaxy S8 image leakers is Benjamin Geskin (@VenyaGeskin1), who has posted about a half-dozen exclusive photos and videos he claims show the unreleased phone. The leaked images range from extremely glossy photos that appear to be official renderings to more elaborate hands-on videos. The leaked images appear to corroborate rumors that “the phones will only come with wraparound displays,” as Bloomberg reported last year, meaning the display will curve over the phones edges on both sides. You’ll also notice that the Galaxy S8 and S8 Plus don’t have a home button in these unofficial images, something that has traditionally been used on Samsung’s flagship phones. Instead, it appears that Samsung is joining the trend of using virtual buttons that appear on the phone’s screen when necessary, similar to the method used on the Google Pixel or LG G6. In addition to several leaked photos, Geskin also posted a handful of videos showing off the device. The videos appear to corroborate a lot of the same information shown in the leaked photos, including the two sizes, bleeding display edges, and USB-C port. The real die-hard Samsung fans will probably notice that the Galaxy S8 and S8 Plus appear to have a lot in common with the Note 7 from last year. Both include the edge-bleeding displays and are much longer than other phones on the market, like the Pixel or G6. We’ll be interested to see exactly how different this phone is compared to the Note 7, and we hope it’s not just the omission of a home button. Oh yeah, and there probably won’t be a stylus in the Galaxy S8 or S8 Plus either. Update 3/1/17 (8:00 a.m. ET): Smartphone leaker Evan Blass (aka @evleaks) dropped a bombshell this morning when he posted this complete image of what appears to be the Galaxy S8 lock screen. Update 3/20/2017 (9:30 a.m.): Evan Blass is back at it again, this time reporting that the Galaxy S8 and S8 Plus will come in three different colors: black sky, orchid grey, and arctic silver. Update 3/20/2017 (9:30 a.m.): The leaks are coming from everywhere at this point. Here are a few short video clips from YouTube user Slashleaks that appear to show the Galaxy S8 in black sky. Update 3/20/2017 (9:30 a.m.): This is one of the clearest videos of the Galaxy S8 we’ve seen. It comes from YouTube user KK Sneak Leaks, who has posted several more photos on Twitter. Will the hardware be that much better? What’s fascinating is that we can actually deduce a lot about the Samsung Galaxy S8 just by looking at the leaked photos and videos. For example, it’s obvious, based on some of the videos, that the phone will include a 3.5mm headphone jack (unlike the newer iPhones). The Galaxy S8 will also come equipped with a USB-C port and fingerprint sensor on the back. The fingerprint sensor appears to be positioned just beside the rear camera, a rather unusual design choice for a premium smartphone. Most other phones with a fingerprint sensor on the back (like the Huawei 6P or LG G6) place it right in the middle of the back, where you finger naturally rests. This new placement might make it harder to reach. You’ll also notice an iris scanner at the top of the phone near the selfie camera, like the one on the Note 7. In addition to some of the clues we’ve picked up from the purported leaks, we also have a set of technical specifications released by reliable leaker @evleaks, who recently tweeted an official-looking list of tech specs. If true, the Galaxy S8 Plus will include IP68 dust and water resistance, 64GB of memory with microSD expansion support, wireless charging, an iris scanner, 8 megapixel selfie camera, and a 12-megapixel rear-facing camera. The Korea Herald has also been reporting that the Samsung Galaxy S8 will include a 4K resolution display (2160 x 3840), but most other outlets disagree with this assertion. Rumor blog SamMobile reports the Galaxy S8 will retain the Quad HD Super AMOLED (1440 x 2560) display used in its predecessor. According to @evleaks, the display will be just slightly better than last year’s model, using a Quad HD+ (3200 × 1800) display, meaning it will be slightly bigger and would use the same 18:9 aspect ratio as the LG G6. Although we’re not exactly sure how many pixels the screens will have, we are fairly certain the screens are going to be huge. SamMobile reports that the new displays will be 5.7-inches and 6.2-inches for the Galaxy S8 and S8 Plus respectively—an increase of about half-an-inch from the phones that debuted last year. Is the software new or exciting? The Galaxy S8 and S8 Plus are rumored to ship with Android 7.0 Nougat, the same version of Android that ships with the LG G6 and Google Pixel. The only difference is that Samsung will use a custom version of Android that is similar to the TouchWiz variants of the past. From what we’ve been able to gather, it also looks like Samsung will not be supporting Google Assistant, the new text-based artificially intelligent assistant from Google. Instead, Samsung is expected to release its own artificially intelligent assistant. Last October, Samsung quietly acquired Viv Labs specifically for the purpose of building a digital assistant that could rival Siri, Alexa, and Google Assistant. So far, very little is known about Viv Labs’ AI capabilities. SamMobile reports that the Viv-based assistant will be named “Bixby” and work across most native Samsung apps like the photos app or email app. The Guardian is less sure of the Bixby name, but corroborates SamMobiles report that the AI will work across all official Samsung apps and includes image recognition, meaning you can ask it to show you specific images from your photo gallery by simply asking. Other software rumors include a Windows Continuum-like feature that would allow you to plug your phone into a monitor for a more desktop-like experience. The feature seems like a stretch, especially considering how conservative Samsung appears to be playing it with all other aspects of the phone. Probability of exciting new software: Moderate. New AI could be cool! Update 3/20/2017 (9:30 a.m.): The rumor blog SamMobile just published screenshots of the Galaxy S8 launcher and app icons. A developer has since taken the icons and created an unofficial icon pack using the images. The Galaxy S8 and S8 Plus are expected to hit stores April 21, about one month after they premiere at Samsung’s special media event. Rumors suggest pricing will be around $800 after currency conversion, however, Forbes reports the cost could climb as high as $950-$1050. If true, it would match price rises that are also expected with the release of the next iPhone. The batteries are also rumored to be 3,000 mAH and 3,500 mAH in the small and bigger phone respectively. Samsung blamed battery size for its exploding Note 7s last year, so it’s interesting to see that the larger phone is expected to have the same size battery as the ones that were exploding. We’re obviously hoping that Samsung has this situation figured out by now. One of the last things that might get people excited is the sound system included in the phone. The Galaxy S8 is rumored to ship with AKG headphones and also includes the words “tuned by AKG” on the back, meaning the audio output might be a little better-sounding than usual. We already saw this AKG partnership in action with the announcement of the Galaxy Tab S3 at MWC, and it makes sense since Samsung acquired AKG’s parent company Harmon International for $8 billion last year. For the most part, this is a marketing ploy, but we hope the AKG headphones that are rumored to ship with the Galaxy S8 are at least better than the crappy Samsung ones we’re used to seeing. Luckily for all of us, we don’t have to wait much longer to sort out the true rumors from the false ones. We’ll be updating this post as rumors and leaks continue to hit the web, and as always, we’ll be on-site on March 29 reporting all the breaking news and giving your our first thoughts on Samsung’s next major smartphone release. Update 3/20/2017 (9:30 a.m. ET): Images published online show a pair of wired AKG headphones believed to come with the Galaxy S8. The headphones feature a braided cable and in-line remote control. You can see more photos here. Update 3/20/2017 (9:30 a.m.): Evan Blass published what he believes will be the final prices of the Galaxy S8 and S8 Plus. The Galaxy S8 is expected to be about $860 USD and the S8 Plus is expected to cost $100 more. Update 3/20/2017 (9:30 a.m.): Mobile tech reporter Roland Quandt recently tweeted the same prices as Evan Blass, lending credibility to the leaks.